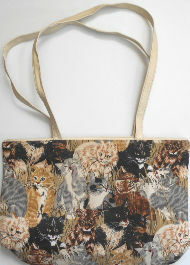 This cat shopping tote will hold your largest items with its two shoulder straps. The vinyl and fabric tote is 15" wide at the top, 11" high and 4 1/2" deep. Each shoulder strap is 3/4" wide x 28" long. One inside zippered pocket. Zipper top closure. Previously owned but in good condition.